Showing that you can throw a luxe party for less is mum Florence who created this beautifully rustic Mexican party for her son Alexander. The theme was inspired by Alexander’s love for the film Turbo and includes some great party hacks with gorgeous results. 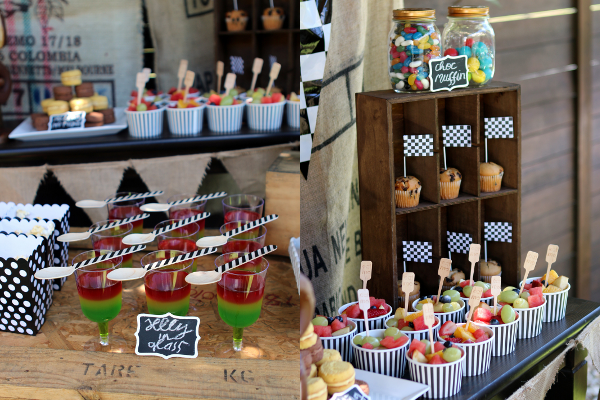 With wooden crates, burlap bunting, and some colourful sombreros, Alexander’s birthday party had a rustic style with a splash of festive colour. And so many delicious treats! I just want to run into these pictures and start celebrating. Florence knows that you don’t need to spend big to have a big fiesta. 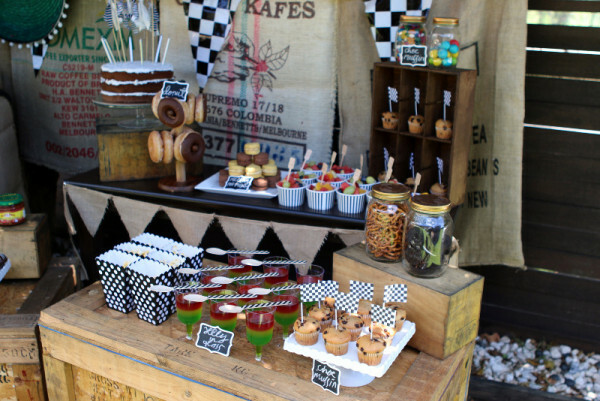 She sourced some racing car tyres and wooden crates from her husband’s work to create cool tables with a Turbo feel. And I just love this unique idea for displaying the doughnuts. 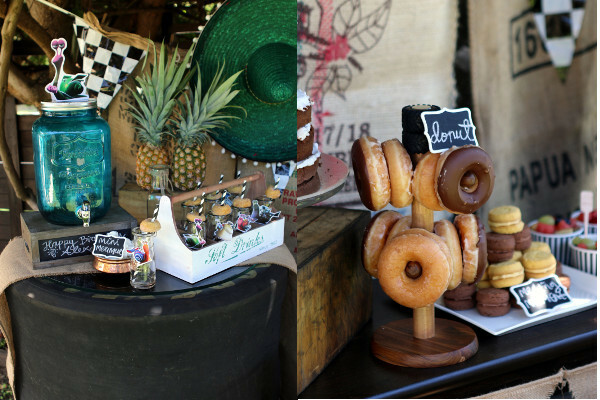 Florence used a cup holder from her kitchen to hang the doughnuts and finished the look with classic chalkboard signs. 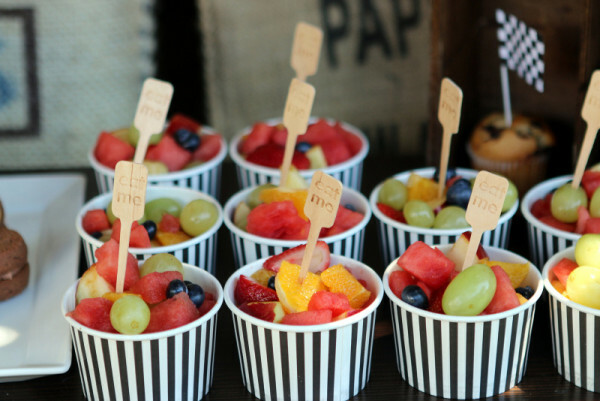 Fresh fruit treats that the kids will want to eat thanks to these lovely ‘eat me’ toothpicks. 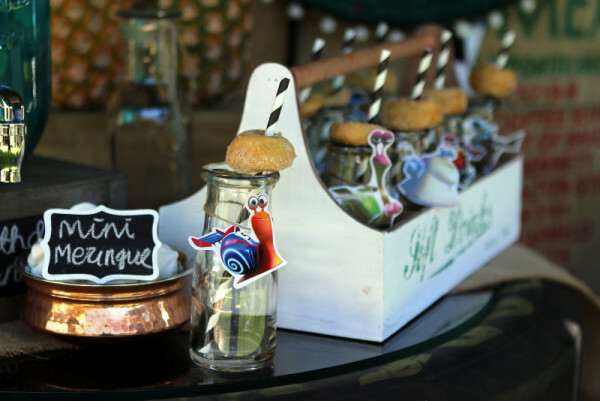 And check out the mini doughnuts used as bottle toppers, such a fun and sweet idea! These pretty bottles and bottle box came from The Little Big Company and Florence says she has used them for more than one party. Such a good investment, not only for birthday parties but any time you need to serve drinks up to a horde of kidlets. The rustic burlap bunting, table runner, and wooden muffin box were all found at Typo. Florence made much of the decorations herself, including cake and cupcake toppers and party bags. This mum knows a thing or two about delightful party decor because she runs Birthday in a Kit, an online store for affordable designer party ware. 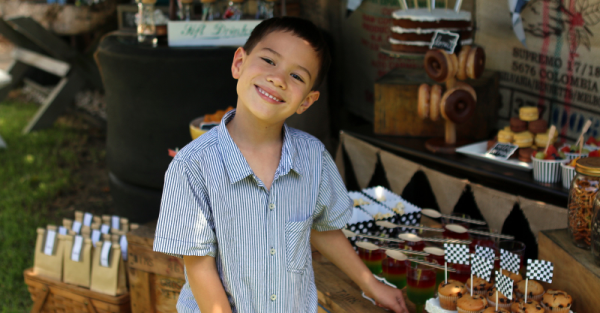 And it looks like the spread was a smash with this happy birthday boy, what a bright smile! If you love what you see here come take a look at the Hello Kitty party with a vintage twist that Florence threw for her daughter back in May. Want to share your child’s wow-worthy party with us? Then just fill in the Show us your party form on our contacts page. While we can’t reply to every email, we’ll certainly let you know if your party is chosen to be showcased on Babyology. We can’t wait to hear from you and look forward to seeing your amazing parties!